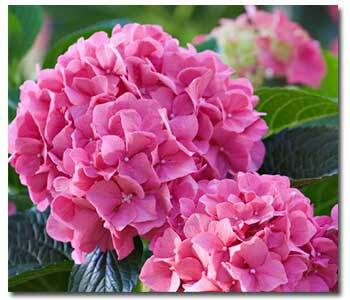 You may have heard that you can change the color of a hydrangea’s flowers by adjusting soil pH. But there’s a little more to it than that. First note; not all hydrangeas produce blue flowers. Hydrangeas with white or cream flowers, such as Annabelle hydrangeas, oakleaf hydrangeas and members of the PeeGee family, can only produce white or cream flowers. Sometimes their blooms take on a pink tinge at the end of the season, but that’s about as colorful as they get. Hydrangeas with bloom colors that range from pink through blue and purple usually belong to the hydrangea cultivars known as mopheads and lacecaps. These types of hydrangeas have the interesting ability to change the color of their blooms based on the chemistry of the soil. When grown in alkaline soil, the bloom colors are pinker. When grown in acidic soil, the bloom colors are bluer. Because it’s the soil chemistry that determines the bloom color, the variety names given to these types of hydrangeas means very little when it comes to bloom color. For instance, Nikko Blue, Pretty in Pink, Forever Pink and Blue Deckle, all have an almost equal chance of blooming pink or blue, depending on the soil they are planted in. So remember that even if you purchase a hydrangea in bloom, you cannot be sure the plant will produce the same color flowers once it’s growing in your garden. 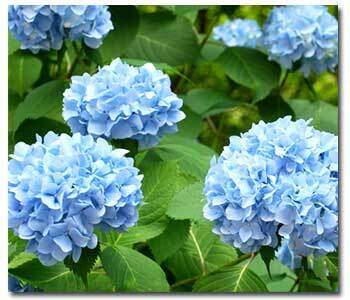 To manipulate the color of a hydrangea’s blooms, you need to manipulate your soil’s pH level and mineral content. This is not something you do just once. In order to maintain growing conditions that result in a specific bloom color, you may need to apply special soil amendments several times during the growing season. To really experiment with the color of a hydrangea’s blooms, consider growing the plant in a large pot. Because you will be working with a much smaller amount of soil, it will be much easier to maintain the desired pH of the soil. Start by testing the pH of your soil for its levels. Be mindful that the health of the plant should be your first priority. It’s quite difficult to make a dramatic change in soil pH, and doing so can adversely affect the overall health of the plant. While hydrangeas come in various colors, what you feed them will determine how they will flower in the future. To keep the color of pink and blue blooms, treatments to the soil need to be started in fall and early winter ahead of the blooming period. Alkaline or neutral soils make pink flowers, while acid soils yield blue flowers. Southern California tends to have alkaline soil, so if you don’t treat the soil, you will end up with pink flowers. Keep in mind, however, that whites will remain white, some pinks will stay pink and other pinks will only change to purple instead of blue. To create blue flowers, you need to alter the soil so that it is acidic–a pH of 4.5 to 5.0. To do so, use a balanced, water soluble, acidic fertilizer with little or no phosphates, since phosphates are alkaline. Each fall or winter, also apply 1 tablespoon of aluminum sulfate per foot of plant height. Mix with water and drench the soil. To maintain pink flowers, you will need a soil with a pH of 7.0 to 7.5. Use a balanced, water soluble fertilizer and add superphosphates to the soil in the fall or winter. Soil pH test kits can help determine your soil’s pH level. Check with a Grangetto’s Garden Pro for help determining which products will work best for your project.